Last Wednesday I was a lucky guest of Dave Lackie and Teeez Cosmetics to celebrate their North American Launch! We started off at the innovative Teeez counter at the Hudson’s Bay store in Downtown Toronto. Their counter allows you to interact with this brand and their makeup in a whole new way. For instance, if you like lipstick but don’t want to remove the one you currently have on, you can simply scan your face at one of their mirror screens and then it will superimpose that lip colour onto you lips so you can see how it will look on. There are other awesome touch screens and fun things to do when there. Learning about the interactive counter with Paul Van Der Wal, Global Makeup Artist for Teeez Costmetics. We then moved to the dining area that was incredibly decorated with large flower bouquets and an elegant long table for us all to sit at. Makeup was everywhere! It’s really easy to spot Teeez Cosmetics because their packaging is so funky and colourful. The great table set up and everyone mingling while playing with Teeez makeup. We played with all the different lipsticks, eyeliners, blushes and eyeshadows. They were also giving makeup touch-ups. The Teeez team was extremely sweet and really spent time chatting it up with all of the attendees and introduce us to Teeez. While enjoying our amazing dinner, Dave Lackie and Paul Van Der Wal talked about Teeez and Paul’s amazing journey in fashion and makeup and becoming the Global Makeup Artist for Teeez. Each guest left with an awesome tube of makeup and a fun bracelet with skulls on them, designed by Daniel J. Now on to the Makeup! Let’s just start off with the packaging. Teeez, which is based out of the Netherlands, is all about being cutting edge and their packaging screams fashion. Looking at it now I see fun colours, flowers, skulls and stilettos in the print. They take their inspiration from the runway and put those looks together into a new collection. As Paul Van Der Wal explained, you no longer need to wait 6-12 months for a runway look to make it to the mainstream, Teeez is all about making it happen now. 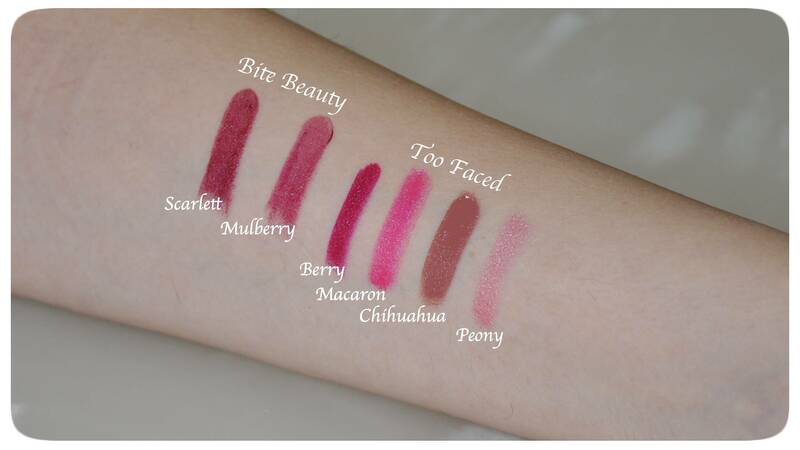 The lipsticks are nicely pigmented needing only one swipe to give full coverage. The one I have, Hyped Mauve, smells like chocolate! This brown colour is soo 90s, perfect for this year’s fall trend. The eyeshadow quad has buildable pigmentation so that you can intensify the look to your liking. I love the purple shades which were inspired by Indian fabrics. I am excited to use the grey liner with the shadows and can never go wrong with a black mascara. I do think the colours are super fun and the pigmentation is pretty good. My personal favourite items are their single shadows because they had such amazing pigmentation and were extremely creamy! I’m going to the counter to pick one up the next time I go to the mall. Thank you, Dave Lackie, for an amazing evening discovering this brand! Have you tried Teeez Cosmetics? What is your favourite item from them? I fell in love with this brand about a year ago when I was introduced to the rescue balm in my Topbox. It helps relieve irritated skin so I use it on my dry skin patches, cuticles and lips (see it here). Ever since then, anything I’ve tried has been a hit in my books. I raved about Nova Scotia Fisherman on MyLipAddication.com’s podcast when discussing my top 3 favourite brands with Cat. What makes these products so great? I think it is because it’s a 100% Natural Body care line infused with Nova Scotia Kelp (yes! KELP!) which has beta-carotine and antioxidants. Our bodies convert beta-carotene into Vitamin A which is great for the skin. Antioxidants limit the production of free radicals which can damage the skin. What awesome things does kelp do? Well…. Recently I’ve been in love with the Sea Salt Soap*. It smells absolutely delicious. I have a sample and full size of the soap bar and I love how the shower smells whenever I use it. These soaps remind me of my grandfather because he actually used to make soaps himself. The process wasn’t simple but we would end up with these beautiful handmade soaps that were great for the skin and made with love. That’s who the Nova Scotia Fisherman team reminds me of, my family, and rightfully so because this is a family and friend owned business. I have dry skin and I like when a product really works for me. That’s how I feel about the lip balms. I especially love the Fisher-Mint* (ha! such a cute name! ), not only does it nourish my lips, but the added smell of mint makes mouth smell a bit fresher too. The sea salt and caramel xtreme lip care balm just smells like a yummy butterscotch. I reviewed this before in my favourite from the boxes and I’m still loving it, the lip balm minnow is always in my purse. Another reason Nova Scotia Fisherman is a favourite of mine is because they are environmentally conscious donating a portion of the sale of each item to the Nature Conservancy of Canada to protect our plants and wildlife. I love how nourished my skin feels once I use these products, it must be the ingredients and how well they work for me. Currently I’ve only been able to find products on their website, but I do look forward to trying more from them. I’ve been eyeing the hand and body cream and probably going to try those next. Have you ever tried anything from this brand? What are your skincare faves? *I was graciously gifted these products from Nova Scotia Fisherman. My thoughts and reviews of this brand are my own and 100% honest. MyLipAddiction.com Beauty Podcast is Live! I’m the first guest! The day is finally here and if you haven’t heard Cat’s new Beauty Podcast then click below to listen! I was her first ever guest and so this is extremely exciting for me! Click one of the links below to listen! Be sure to also subscribe through the portal that works best on your phone/computer because Cat will be releasing Podcasts interviewing a new guest weekly! I really had a great time! Thank-you Cat! 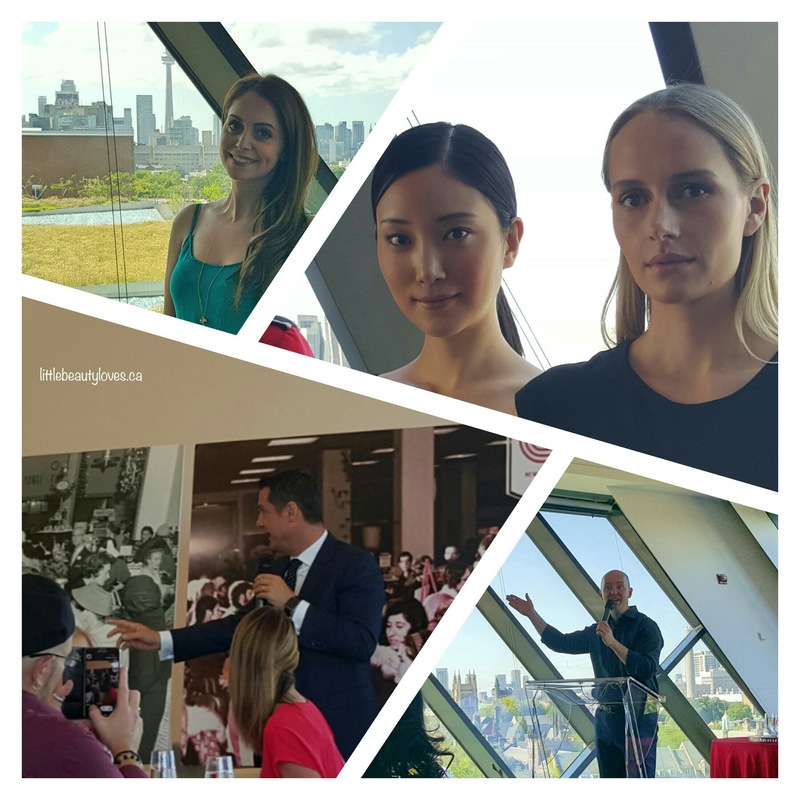 Last Wednesday, I attended the #LauderLovesCanada Breakfast Event thrown by the amazing Dave Lackie. Guests were greeted by the Estee Lauder team who outlined the details of the day. There was lots to enjoy! Makeup was everywhere and you could get a make-over by the professional Lauder team. There was also a delictable candy station, a handsome mountie to take photos with, and an absolutely stunning dining area that over looked the CN Tower. Everyone was flocking to the delicious candy station, I personally loved the touch of adding Canadian themed sugar cookies. There was also fruit juice blends handed out. The dining room was so perfectly decorated. The dining hall was filled with photos of Estee’s trip to Canada in 1970 for her launch of a Canadian beauty line. The event was a tribute to that first visit and it was all about how Estée Loves Canada – everything was in red in white. The timing was perfect since it was only a few days before Canada Day! The largest bottle of Night Repair I’ve ever seen! There was also tons of makeup everywhere. The breakfast was delicious, we started off with a yogurt and strawberry puree, with delictable granola. You had an option for the second course and I decided on the the delicious brioche French toast. During breakfast we enjoyed a talk with Philippe Warnery, General Manager, Canada affiliate of Estee Lauder Companies. He described the first time Estee Lauder came to Canada and how she created a beauty line that was Canadian focused. How special is that! I love that Estée Lauder viewed us Canadians uniquely and created a whole make-up line designed specifically with them us mind. We were the first international venture for Estée Lauder as a brand! We saw the look of the 1970s that Estée created and new a modern twist for the Canadian today. 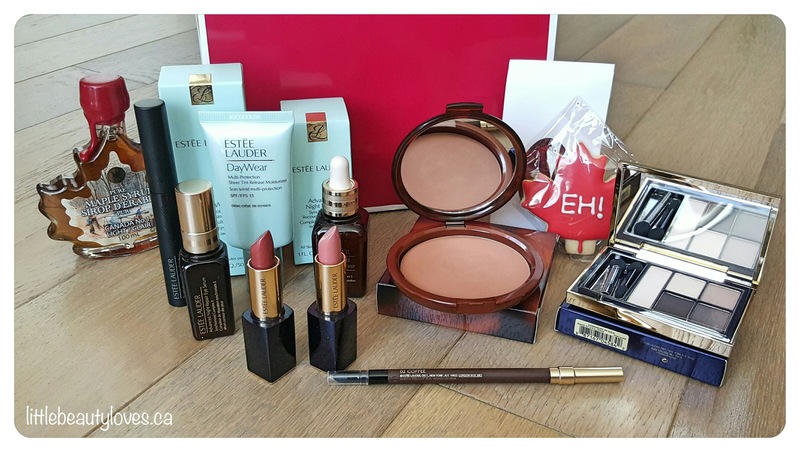 Each guest left with an incredible gift bag full of Estee Lauder products to re-create the looks at home. I’ve already started playing with the products! Of course, Advanced Night Repair is one of my faves, so I’m excited to use the Eye repair too. I also love the eye liner pencil. It’s very soft and dries quickly that makes it unmovable. If you want to soften up the look you can smudge it out with the rubber tip on the other side. 1.Use brown liner on the lower lash line to soften up a dramatic eye-look, they said it looks amazing especially if you wear black liner on the top lid. 2.Take your favourite serum, they used advanced night repair, rub it in between your hands to warm up and then dab on top of your skin. If you do this on top of your makeup, it acts as finishing primer to lock your make-up in place and give you a dewy, even finish. This was such an amazing day! Thanks again to Dave Lackie and Estée Lauder for putting together this spectacular event! A few weeks ago I won this adorable eyeshadow palette from a giveaway hosted by Tigrista. Her blog is full of a lot of great posts about product reviews and unboxing subscription boxes, I love reading her posts! I’m so excited that I won so thank you very much!!! NYX’s Rocker Chic Palette is really cute and I thought I’d do a little review here if anyone was interested in picking it up: I have the 5 shadow palette in the colours California Dreaming. It has 3 shimmer shadows and 2 mattes. It has an interesting blend of colours that I wouldn’t normally go for but they are surprisingly really easy to wear, even the electric blue colour. I like that the colours I would use most in this palette are on the larger side. I like wearing the shimmery pink (which actually on the pale pink side) all over the lid and I like using the matte black to darken the crease just a touch. That’s the look that I created below. It’s a great everyday look for me. Sometimes I even like wearing the blue on my lower lash line for a pop of colour. These shadows are really creamy and easy to blend. They are also surprising pigmented and doesn’t crease in my lid. The shadow is long lasting but after about 8 hours I find that it dissipates. I would suggest to wear eye shadow primer to increase the colour longevity. I’m really impressed with these shadows, I’d be interested in trying other NYX palettes and shadows. Have you tried any shadows or palettes from NYX? What are your thoughts? On Thursday, I was one of a lucky few invited by the amazing Dave Lackie to the Mugler Muse VIP Twitter Follower Dinner in celebration of Thierry Mugler’s launch of their newest fragrance, Angel Muse. I was extremely happy that I had an opportunity to be part of a fantastic evening! We were greeted by the sweet Thierry Mugler Team and walked into an elegantly decorated room. I have a huge love for Mugler scents. Alien has always been my stand-out fave and I can usually smell it on someone else from a mile away. Those who are familiar with the Thierry Mugler line know the distinctiveness of the perfumes, which is what draws people to these scents. They are so unique, and in wearing them, bring out our own uniqueness. I’m totally having a blast here if you can’t tell. There was perfume everywhere! I also loved that they showcased some of Thierry Mugler’s fashion pieces. Even the dresses are unique, mixing a bit of sport with elegance. I would wear them in a heartbeat. This event was way too much fun! I had a great time connecting with bloggers and the Thierry Mugler team. They had a beautiful set-up with bottles of the fragrance scattered all around the room for everyone to pick up and spray (I immediately sprayed it on my wrist, and continued smelling it the whole night). The team had also set up a few of the Thierry Mugler Fashion pieces which were amazing. I finally got to meet the amazing Dave Lackie! I love following his twitter to learn about what’s new and now in the makeup world. We also had a group shot with the beautiful Nina Westbury! She’s so gorgeous and sweet! The Theirry Mugler team came all the way from Montreal to throw this wonderful event and to talk about the new fragrance. The night was so lovely, with an amazing dinner and talk about the new fragrance. We were tweeting with Angel Muse lovers around the world! I am also extremely happy that I finally met Dave Lackie! Just the sweetest person ever. Nina Westbury, pro make up artist, also attended the event which was awesome for me because I had the opportunity to pick her brain about makeup application techniques! This scent is so spell-binding. It has this amazingly fresh smell that is in your face, but yet, so easy to wear. What I’ve always loved about Thierry Mugler perfumes is their staying power- you can always smell them no matter how late into the day it is, and this is no different. Fragrance notes: Grapefruit, Pink Peppercorn, Hazelnut Cream, Vetiver, Patchouli. I love the combination of these because it makes it sweet but also clean, just the most perfect scent for the summer. Thank you to Dave Lackie and Thierry Mugler for putting together such a great event. The evening was magical. Many bloggers have been writing about their experience at Genbeauty in Toronto and I’ve enjoyed reading them all! Ipsy finally brought Genbeauty to Toronto for the first time and was it like being a kid in a candy store! Genbeauty is an event that connects fans with their favourite youtubers and brands. You learn about new product launches, can purchase some products at discounted prices and enjoy free gifts from each brand. Many of the larger booths had some fun activities or things that you could do to score even more products. Also, each day attendees received a “swag bag” that was full stuff as well. I really enjoyed the fun activities hosted at many of the booths, playing with new makeup & skincare and receiving some great free products! I also finally met fellow blogger Jodi at A Brash Attitude. I had been trying to find her and pretty much accidentally landed next to her in the Too-Faced line without even realizing it! My favourite booth was NYX, they had stations set up where you could play with different products, a video photo booth, a chocolate vending machine and candy everywhere. They were also super engaging with us waiting in the crowd by coming around with candy and keeping us pumped. My favourite freebie was at Makeup Forever. They handed out a gift bag with two of their Aqua XL eye pencils, a duo eyeshadow palette and Sens’eyes eye makeup cleanser. The event was really lively with popular youtubers doing meet and greets every hour and people taking photos, vlogging and having a good time. The only downside was how quickly the lines the filled up! So many times I’d pass by a line that was closed and eventually people just lined up to wait for lines to re-open. I also was a bit disappointed that some brands gave out foil or small samples, worse still, some even ran out of products to give out. BUT! There were a lot of full size goodies so it more than made up for it! If Genbeauty came back to Toronto, I would go again. If you buy your tickets early it really makes the event worth it because the items received are worth well over $300. Did you attend Genbeauty Toronto? What was your favourite booth? I just wanted to start off by saying that yesterday my blog turned 1!! Such an awesome milestone and I want to thank everyone who’s ever read, commented and liked any of my posts! It makes me so happy to be part of this community of bloggers! Looking forward to another awesome year! OK, now on to the post.. In March I met up with the beautiful Adrienne from Beyond the Exterior. She’s an amazing fashion blogger with a lots of personal style. We met in the twitter verse and after finding that we lived super close to each other, decided to meet up and collaborate on a post. Click to here to read Adrienne’s post! I focused on products you could find in the drug store that were reasonably priced but were good quality (I wasn’t be able to put together a whole face look with items at Sephora!) For me, spring is a chance to wear light and bright makeup because I like looking rejuvenated after the winter and I want it to be an easy makeup routine to whip together before enjoying a day out in the sun. Flower Beauty Foundation: Last year I reviewed this foundation and I’ve actually been using it ever since. It provides light to medium coverage and it feels so nice on my skin. I wore this all summer last year and it had great staying power, even on warmer days. $14.98 (Walmart) Covergirl Eyeshadow: You can create many different looks using this quad. I have 700 notice me nudes and I think the colours are perfect for spring and are awesomely pigmented. For my look, I used the first three lighter colours on the lid and darkest shade as an eyeliner. I also used the lightest colour as a highlight. $10.99 (Shopper’s Drug Mart). Joe Fresh Blush in Rose: This is a beautiful blush that adds just a touch of colour which is so pretty for spring. I was really impressed with the quality. $6.00 (Shopper’s Drug Mart/ Joe Fresh). By using the eyeshadow for eyeliner and highlighter I was able to keep my total cost down. This challenge was not as easy as I first thought. Adrienne and I spent quite some time in the mall looking at makeup to determine what would be the best product within our budget. This is definitely the type of look I would go for in the warmer weather because it’s light, easy and super neutral so it would go with any spring outfit. Be sure you check out Beyond the Exterior for Adrienne’s $50 Outfit challenge. What are some items you’d use if you had a $50 makeup challenge? What colours are you rocking for Spring? And don’t forget to follow Adrienne! Name a beauty regimen that you rarely do? Apply Toner! I just can’t seem to get this into my regimen. I’ll wash my face, use a makeup remover, apply serum, then moisturizer but for some reason I just can’t seem to make time for this. Is washing your make-up brushes something that you do regularly? Brushes that I use frequently for liquid makeup (such as foundation or gel liner) get washed every other week, everything else, once a month, maybe. I guess I mostly just wash them once I feel like there’s too much dirt on my brushes. How long will you last with chipped nail polish? I don’t wear nail polish on my fingers, but the minute my toe nail polish chips I have to re-do them. So, not long, haha! How long will you put off buying/replacing a beauty product, even if you need it? Sometimes I buy two of something I use the most just because I don’t want to run out. What is your worst beauty habit? Not getting rid of old products, I own so many products that I think should have been thrown out a long time ago. Mascara lasts years, right? Name something non-beauty related that you put off doing all the time? I put so much stuff off… I love knitting, but I have years of projects I have not completed. I also need to clean out my makeup…I guess that’s why it’s the procrastinating beauty blogger..haha! When going out somewhere, do you leave getting ready to the last minute? Can you commit to spending bans? I think so. I’ve never really tried. How organized are your make-up and nail polish collections? I think I’m pretty organized. All my makeup fits inside one makeup case, and all the samples I get go into a sample box. I’ve limited everything to one area which makes it easy to apply my makeup in the morning before work. I have only a handful of nail polishes so that’s really easy to keep organized 🙂 They actually all fit inside an old Luxe Box I got a while back. Do you want to participate in the “Procrastinating Beauty Blogger” tag? 1. Copy and paste these ‘rules’ into your post when you write it! 2. Thank the person who tagged you and the beginning of your post. If you are not tagged then just do it for fun, it’s always fun to get to know about the person behind the blog. 3. Follow them if you’re feeling nice and at the end of your post state who you tag, and comment on their blog to let them know you tagged them..
4.Title this post ‘The Procrastinating Beauty Blogger TAG’ . How cute is the packaging on these! Last week I won a very special giveaway that was hosted by the lovely Cat at Mylipaddiction.com. She throws such amazing giveaways every month on her blog and I’m so shocked that I won this one! I wanted to share these amazing products not only to showcase this giveaway but I also think they are great value items and make really good holidays gifts if you are thinking about getting one of these for someone you know (or even as a treat for yourself). According to Sephora these are four of their best selling liquid lipsticks. The colours in this set are; Chihuahua (dusty mauve), Berry (berry red), Metallic Peony (shimmery dusty rose), Metallic Macaron (shimmery warm bright pink). I really love the high pigmentation of these on the lips and they have a nice angled tip applicator that makes putting on the product super easy. They are so cute and small too, and I like that the colours are holiday-ish but not so much so that you couldn’t wear them well into the summer. My only suggestion would be to exfoliate and moisturize your lips beforehand as the formula can be a bit drying. My fave colour that I’ve been wearing obsessively is chihuahua, which is a surprise because I don’t usually go for nudes so thanks Cat for helping me discover something new. I was super excited to try this product out. This is a limited edition holiday pair in Scarlett (deep red) and Mulberry (deep mauve). Sephora has a range of other cute colours. I’ve heard amazing things about this brand and they’re based out of Toronto, Canada! Love supporting my Canadian brands <3. What’s popular about bite is that they create their lipsticks with food grade-ingredients so you can rest easy if you’re the type that eats your lipstick away :). I am in love with these colours. Unfortunately, my camera did not pick up the difference but they are both dark lipsticks, one has a red tint and the other is more purply. One other interesting thing about Bite is that each lip color is infused with super-antioxidant resveratrol to help fight free radicals and support long-term age-repair benefits! I’m really happy to have won this. Thank you Cat for throwing such an amazing giveaway!